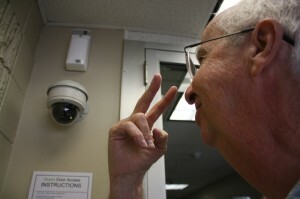 A Texas retirement community is employing a biometric access control system based on facial, voice and behavioral recognition. A CEPro report reveals that the biometric access system works in conjunction with CCTV to act as a virtual concierge for building’s residents. Similar high-level security systems have traditionally been reserved for sensitive government, pharmaceutical or commercial establishments — locations where security was an obvious premium — not retirement facilities. The Pasadena Interfaith Manor Apartments in Pasadena, Texas feels differently as community manager Mike Garcia has installed the SafeRise biometric system. Facial recognition is the primary biometric as residents simply look into the camera to gain access to the building, with voice recognition acting as a secondary means of access. The SafeRise system is a product of Israeli manufacturer FST21 and employs an easy-to-use facial recognition feature. Garcia contracted Alabama-based ion247 to install the SafeRise system in conjunction with their In Motion Identification system. Ion247 offers its In Motion Identification system, which quickly identifies anyone who approaches the door allowing only approved users access after running a combination of biometric scans— face, behavioral, voice and even license plate recognition. The system eliminates the need for keys, cards or access codes. The SafeRise system can effectively decide whether to allow entrance, verify guests or transfer them to a monitoring station where an ion247 representative can provide further assistance. This is also available to the residents themselves; should they need help accessing the building an ion247 employee will be on duty at all times to facilitate access. The system is also bilingual, offering Spanish as an alternative to the complex’s many Latin residents. By simply selecting the preferred language at enrollment, the SafeRise system automatically responds with the appropriate language.